Things are going pretty well when the main things you get kidded about are how polite your people are, how they love to bare a flag when traveling, say “sorry” with regularity, eat maple syrup and see beavers daily, and follow a sport where fighting is a key and loved element of the game. Canada and its Canadians are some pretty swell folks. Born in Ottawa, toddled for a bit in Kingston, grew up in Prince Edward Island, finished the teens out in Calgary, and then started calling SE Asia home in 1999, visits back home to my native land stir memories and remind what’s so wonderful about being from Canada. After a couple days in Vancouver in January 2014 I smiled at how Canadians say “sorry” so often and for a multitude of things. They may perceive to be in your way – “sorry”, let you in front of them at the supermarket because you have only a couple items – “sorry”, bump shoulders in a pub and spill a bit of their beer – “sorry”, they’re generally willing to apologize and move happily on rather than have confrontation. These are pleasant people! Watching the Sochi Winter Olympics at my parents’ place in Nanaimo, I was proud to see Canadian cross country skiing coach Justin Wadsworth set a Russian skier up with a new plank after he broke his ski, allowing the Russian to finish the race. That’s sportsmanship. I’ll bet Wadsworth even said “sorry” once while changing the ski. Canadians help out when it’s the time and place, but we also don’t jump in and push things where and when they shouldn’t be pushed. It’s nice to have a military that’s better known abroad for its peacekeeping efforts, rather than war mongering. We’re regularly there trying to stabilize and assist but certainly aren’t known for being bossy, brash, know-it-alls or overbearing. 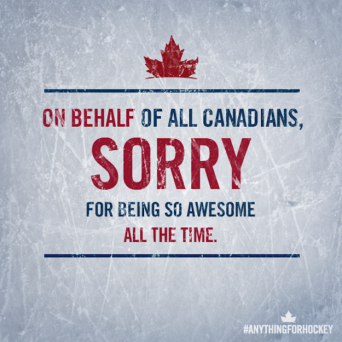 We’re Canadians, we’re there, happy to help and may even say “sorry” along the way. Then Canada nails it again at the Sochi Winter Olympics with the unveiling of a beer vending machine that issues a free brew with the swipe of a Canadian passport. Now that’s keeping your citizens fueled, feeling at home, social and popular with the locals. Yep – that’s Canadian. Look at the crowd with you on a Canadian subway system and it won’t be obvious at first what’s astonishing – you’re part of one of the most multicultural groups on the planet. This is quite a happy, well functioning, culturally rich country, that’s main purpose is openness: welcoming arms for all in pursuit of a fun, free and just life. Canadians are sometimes accused of being bland, boring, and saying “eh”, but we’re also happy to share our maple syrup, live part time in igloos, ice skate to work and have a beaver in the backyard as a pet. Preparing for departure in February 2014 at Vancouver International Airport, on route to Malaysia, a girl walks by and there’s a Canadian flag sewn to her backpack, another man is drinking a Tim Horton’s coffee (a popular chain started by a hockey player and deeply etched into Canadians’ minds for their brew and doughnuts), I hear someone say “sorry” and I’m honored to have this passport in my pocket and be able to return to Canadian soil anytime I wish.